I recommended shorting MTN to my Short Seller’s Journal subscribers in my December 2nd issue. While I expect MTN to lose at least $200 over time, I did not expect nearly 25% of that price-decline expectation to occur in 5 trading days after I presented the idea. Shorting MTN was an idea I had been thinking about for a few months. About two weeks ago I heard a radio ad from a Denver-based, national mortgage firm (American Financing) which pitched the idea of using a home equity loan to raise money for a down payment to purchase a ski resort condominium or house. At that instant I knew the top was in for both the mortgage underwriting business and mountain real estate. Shorting Vail Resorts is pretty much the only avenue for expressing a bearish view on mountain resort real estate. The insiders at MTN must agree with my view. Over the last three months there have been 23 open market stock sale transactions and zero purchases. Over the last 12 months, there have been 38 open market stock sales and 1 purchase. The purchase was for just 225 shares in December 2017. With the help of Fed money printing and highly accommodative bank commercial real estate lending policies, MTN went on a large resort acquisition spree. The highly accommodative Government mortgage programs helped MTN capitalize on 2nd home resort home sales. The stock ran from $16 in early 2009 to an all-time high of $301 on September 4, 2018. The stock trades at a 30 p/e, which is absurd for a business with a top line that grew just 5% year over year for its fiscal year 2018, which ended at the end of September. As the falling economy begins to take a wrecking-ball to the resort industry, Vail Resorts revenues will tank and the Company will begin to take big asset write-downs (real estate and building values). This will send the stock mercilessly lower. Having studied, researched and traded the real estate industry for the better part of 25 years, including trading this sector as a junk bond trader on Wall Street in the 1990’s, I know that mountain resort real estate has a beta of at least 2 vs metropolitan real estate. I have not had a chance to dig elbow-deep into MTN’s earnings report yet. But by the time I release this Sunday’s next issue to my subscribers, I’ll have a good a idea about what happened and why last quarter and where my next bet will placed based on what will likely happen over the next 12 months with Vail Resorts’ fundamentals and stock price. That said, I have mentioned to colleagues that I expect, based on a rapidly deteriorating economy, that this coming ski season – though likely a banner year for snow quality – will fall well short of analyst expectations in terms of skier visits and money spent. You can learn more about my stock shorting newsletter here: Short Seller’s Journal. Absolutely amazing they can put out crap like this: “Still, with GDP growth expected to be 2.3% this year, according to a group of more than 60 economists surveyed by the Journal, market strategists project the current bull market has more room to run.” The WSJ editors just lost all credibility they may have had with that end to the article. How could they find more than 60 delusional [or shill] economists that all say the sky will be blue for years? I’m tired of worrying for myself and my family. Where can I find what they are smoking? Must be some really good hopium. It has not been a seven-year “bull market” in stocks or housing prices, it has been the biggest bull market in money printing and credit creation in history. 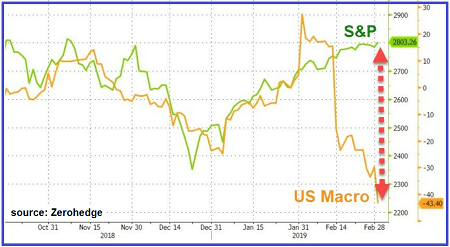 While the media clowns and Wall Street shills celebrate the seven year “bull market” in stocks, the fundamentals underlying the U.S. economic and financial system continue to deteriorate – quickly. 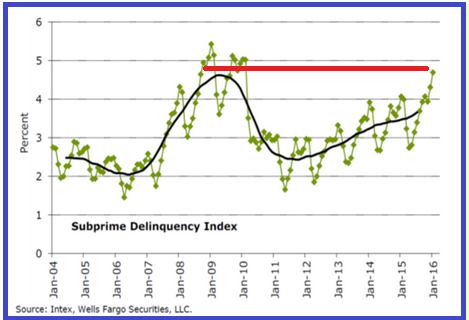 The most recent economic activity “end zone” dance was over February’s domestic auto sales, which seem to be occurring at an all-time high when viewed on an “annualized rate” basis. Of course, no one wanted to discuss the fact that Ford’s sales would have been flat or negative if their huge jump in rental fleet deliveries were stripped out of their numbers. GM’s sales were down slightly, and dealer inventories continue to balloon. It’s no secret that the banks have been willing to extend to auto loans to anyone who can fog a mirror. Credit score is largely irrelevant and there’s no requirement to show proof of income. This ratio is spiking up from both excessive inventory accumulation at the wholesaler level of the distribution system and declining sales of this inventory to the retail sector, reflecting weak consumer spending and an outlook for continued weak consumer spending. The “celebration” of the seven year “bull market” is emblematic of the degree to which propaganda is being used to cover up the truth. If you give me a printing press to print money or an ability to issue an unlimited amount of credit, I can make any object increase in value. The big run-up in the stock market and home prices and in auto sales was enabled by $4.5 trillion in printed money from the Fed and the enabling of an insane amount of credit creation, including derivatives which are nothing more than another form of credit. When this hits a wall – and I think the gold market action is telling us that the collision is occurring or is imminent – it will cause a systemic upheaval that will make 2008 look like a civilized tea party. I have no idea who is throwing cash into this highly overvalued stock market to push it higher right now. Any registered financial advisors or pension managers who are buying into this stock market right now are in serious breach of their legal fiduciary duty. While there’s likely a modicum of retail daytraders and momentum-chasing “hedge” funds chasing the upward velocity, I have a an educated hunch that the Fed and the Treasury’s Working Group on Financial Markets – headquartered in the same building as the NY Fed – are behind this insane thrust higher in the S&P 500 and the Dow. With good reason, too. If GAAP earnings were calculated the way they were calculated 20 or even 10 years ago, the p/e ratio for the S&P 500 would be at its highest in history. Furthermore, “smart” investors would not be chasing stocks higher while earnings and revenues are declining, as they have been for several quarters. The on-balance volume and positive volume indicator signals in the graph above show an extreme divergence from the direction of stock market. This indicates that – away from the key stocks used to push the S&P 500 and Dow higher – big money is unloading stocks while the SPX/Dow appear to show strength. It’s brings to mind the “Rome burns while Nero fiddles” metaphor. In the graph above, you can see that the S&P 500 appears to be carving out a pattern similar to the path it took from last August through early November, before it dropped off a 12.5% cliff. No one knows if this same pattern will repeat, but there’s always the chance that the Fed is trying to push the S&P 500 back up to its 200 dma (red line). We’ll know if this gets accomplished soon enough. The suggested trade was to buy puts or short BGFV before the close on Tuesday and cover it or sell the puts right after the open on Wednesday (today). I had some additional analysis to support the trade idea. BGFV actually “beat” its earnings number but it required some hard-core GAAP engineering to accomplish this. Revenues were in-line but the stock was hit for over 18% at the open today. Several subscribers emailed me today with their success on this trade: “Good call on BGFV. Scalped it twice…Thanks for this trade, 117% return in less than 24hrs, not too shabby, lol…Got small position in the $12.50 puts just before the close. Sold this a.m. as instructed for 112%…We did this trade-our first with your service–and got a little better than a triple!! You can subscribe to the Short Seller’s Journal here: LINK or by clicking on the image to the right. It’s been a difficult stretch for shorting this market but most of my emphasis and ideas are focused on longer term trade ideas (12-18 month). I always include ideas for using options with specific examples. The intra-week email “alert” was not originally part of the service but I tried it out several weeks ago and had a great response. I only send them out when I come across an idea that merits doing so. 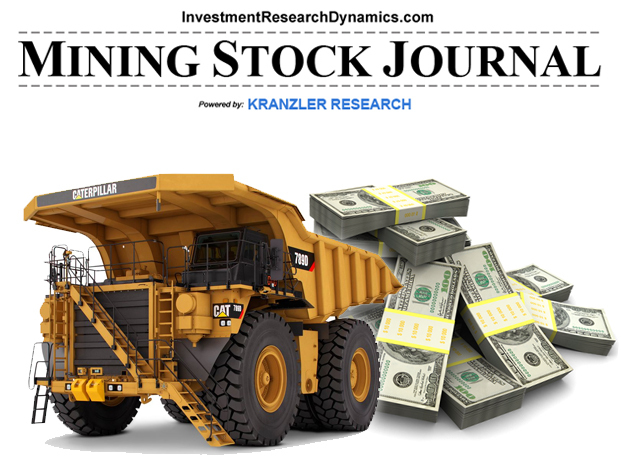 Finally, SSJ subscribers will be able to subscribe to the coming-soon Mining Stock Journal (hopefully Friday) for half-price. The effect of the collapse in energy is starting to exert its force on the financial system and economy. JP Morgan warned last week that it will need to reserve more against its energy assets. These “assets” are loans that the bank was unable to “syndicate,” meaning JPM was stuck with these loans because it was unable to sell these loans to other banks or investment funds. Thousands of energy sector jobs have been cut with likely 10’s of thousands more to come. These are the “direct” job losses. “Indirect” job loss will occur as the wide swathe of economic loss in the energy sector begins to reverberate widely through the economy, especially in the housing, auto and service sectors. The jobs bloodbath is just getting started. Morgan Stanley announced that it is cutting 25% of fixed income operations; several other big Wall Street firms have announced plans for large job cuts this year; major U.S. retail chains have announced the closing of 6,000 stores nationwide. Outplacement firm Challenger-Gray reported a couple weeks ago that, according to its job-cut data, layoffs in January jumped 200% from December. This week’s issue of the Short Seller’s Journal features an extraordinarily overvalued restaurant industry stock that is aggressively issuing debt to buyback shares so insiders can dump their restricted stock units. This company has a huge negative book value. The issue also features a homebuilder short that has, minimally, another 65% of downside ahead of it in the next 12-18 months. Insiders are dumping shares of this company like there’s no tomorrow. There have been zero open market purchases of this Company’s stock by insiders over the last 12 months. The Company has more inventory and more debt than it did at the peak of the housing bubble but its revenues and number of units delivered are running about 2/3’s of what they were at the bubble peak. Finally, the issue features a silver mining company which is now a big silver mine plus two potentially highly prolific gold mines plus some ideas for using puts to replicate shorting AMZN, which I think is ready to roll over again and head lower. This week I feature a two stocks that can treated either as a “quick hit” or positioned as a long term short. I’m also going to include a highly undervalued silver mining stock as a “contra” stock market idea. For new subscribers, because the precious metals sector tends to move inversely to the stock market, going long mining shares is similar to shorting stocks. I also review some strategies for using puts to either speculate on a big move lower or replicating a longer term short position in AMZN – see AMAZON dOT CON. You can subscribe by clicking on this link – SHORT SELLER’S JOURNAL – or on the image below. 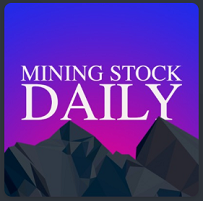 Subsribers to SSJ will be able to subscribe to the Mining Stock Journal for half-price. The debut issue should be out this upcoming week or the following week at the latest. Fundamentals Uber Alles – Are You Prepared For The Next Leg Down? Certain aspects of this market have become relatively easy to predict. I told my partners yesterday that they would take silver below $15 once the U.S. paper market was the only market open market on Friday (today). Soon as the London p.m. fix was set, the NY paper market manipulators went to work and they hammered silver. Interestingly the mining stocks have been very reluctantly going down these past two trading sessions. This is quite remarkable given that, from the HUI’s low-close of 100.77 on January 19, the index has run up as much as 67%. It’s due for a “technical” pullback but it seems to be yielding rather grudgingly. There may be a message in that. 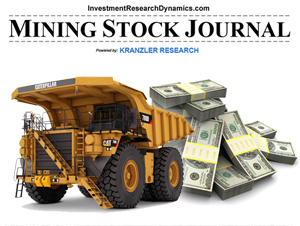 I’ll be rolling out a Mining Stock Journal next week to complement my Short Seller’s Journal. Subscribers the SSJ will be able to join the MSJ for half-price. Everyone is getting frustrated with this bear market rally. In 9 trading days the S&P 500 has gone up 122 points, mostly in big “chunks,” despite increasingly negative economic developments. If anything points to the fact that this stock market is broken, it’s the fact that exchange operators had to “unplug” the electronic markets early yesterday morning to halt an imminent rout in stock futures. At it’s nadir yesterday during the NYSE session, it looked as if the S&P 500 was about to drop off a cliff but mysteriously a big buyer appeared and stimulated a “V” rally. “The mispricing of assets across world markets has reached epidemic proportions” – This Is Why You Can Expect Another Global Stock Market Meltdown (Marketwatch). When the fundamentals don’t “fit” the valuations, eventually the valuations “regress” toward the fundamentals. This is not an opinion – this is a law of markets. Currently the global Central Banks are attempting to change this law. It’s a pretty pathetic visual of Ben Bernanke or Janet Yellen confronting Atlas, who merely shrugs. After selling back down to $18 from $28 by Dec 24, Oprah tweeted out a video ad promoting her participation in Weight Watchers (“come join me ladies”). The stock jumped 26% from the December 24 close, to close out 2015 at $22.80. Based on the December 31 close, the stock trades at 26 p/e and 13x trailing EBITDA. The Weight Watchers brand name is quite stale with little to no growth prospects despite Oprah’s “quick fix” presence, the stock is significantly overvalued. Especially given that the stock was trading at $4/share in August. I find it testament to the insanity of the current stock bubble that the market value of a company like WTW can move up 700% in four months based on the presence of Oprah Winfrey on its board of directors. The stock dropped down below $11 by Feb 8, when Oprah again tried to pump the stock (note: she owns 10% of the stock and her promotional pump was 2 weeks before earnings). The stock ran up over $15. WTW announced earnings after the close last night and the stock is getting drilled for 27% back down to $11 today. Nothwistanding the fact that I’m calling for an investigation of Oprah and her stock manipulation games, WTW fundamentally is not worth $5, let alone $15. I wanted to use this example to illustrate my point that, regardless of the short term zigs and zags in the stock market, eventually the gravitational pull of fundamentals take over and the stock market will seek its intrinsic value. There’s still a plethora of stocks trading at insane multiples of revenues, cash flow and book value. The market bottom won’t be seen until all of these stocks have either gone out of business or are trading at valuation levels which reflect the ability of their business models to generate bona fide – not “adjusted non-GAAP” – cash income based on the actual demand for their products or services. Rest assured we are a long way from that level on the Dow/S&P 500. 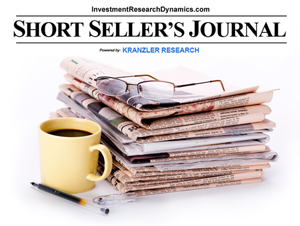 The Short Seller’s Journal is a weekly research and trading report which presents at least two short ideas per issue. It also provides ideas for using put and call options and capital management/trading advice. It emphasizes a long term, fundamental approach to shorting the market. You can access it clicking here: Short Seller’s Journal.